Hello everyone. 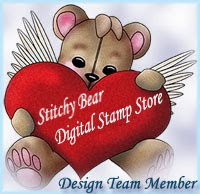 Today my project is for Scrapbook Stamps Society. It's my first post after my brake time. This lovely image by Sherri Baldy. I made an EnveloBox. (i'm getting tutorial ready for it). This was my first time coloring with Distress inks, not sure if i like it. My Dear you still did a perfect job coloring,using the distress is like painting with watercolor, very different the copics, you'll get use to them. I love it. thanks for sharing Nataliya and have a wonderful weekend..
Nat this is so pretty. It made me think that you had your daughter in mind when you were putting this together. It is just filled with gorgeous punches and die cuts. I think the distressed coloring is gorgeous. I would like to try it myself. Thanks for the inspiration.